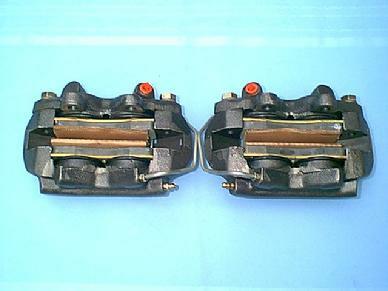 These are BRAND NEW, Never used, 4 Piston K/H Style Calipers for all FACTORY Disc Brakes on the 1964 1965 1966 1967 Mustang Fairlane Falcon Comet Cyclone. Will fit perfectly on all Factory 4 Piston systems. You will need to put a note in with your order as to year. 1965-1966 had a 3/8" Port, the 67's had a 7/16" Port---Please tell us which you want. Fenco Canada Casting!! Kansas City Machined for us. You will get these LOADED (Has Pads, Stainless Steel Anti Rattle clips, and Crossover lines already installed. Pistons are Nickel Chrome Plated---NO MORE STICKING Pistons as the originals did, with plain cast pistons. Need a set of new Rubber holes from calipers to hard line, inquire as we have these as well, Raybestos Quality. These are BRAND NEW, Never used, Single Piston Style Calipers for all FACTORY Disc Brakes on the 1968 1969 1970 1971-73 Mustang Cougar, All1968 1969 1970 1971 Fairlane Falcon Comet Cyclone Torino, Montego. Will fit perfectly on all Factory systems. 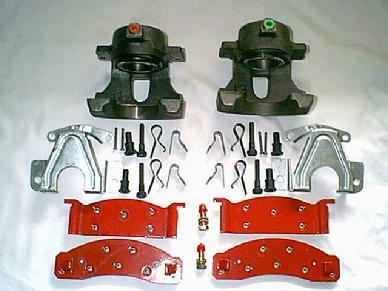 You will get these LOADED (Has Pads, ALL Hardware, Caliper Shield, and are ready to install.